For the past 10 weeks we've been paying homage to world class chefs and have enjoyed presenting some great dishes inspired by their food. 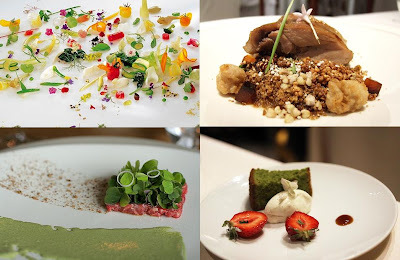 This Thursday we conclude the series by recapping some of our favorites from the series including dishes in the styles of Rene Redzepi, Michel Bras, Pascal Barbot, Inaki Aizpitarte and QuiQue DaCosta. Mission Street Food will close on Saturday June 5th with plans to re-open in a different format later this summer. Mission Burger is closing for good? Oh noes! Whoa! Wait a minute. Did I just see that Mission Burger will be closing? Permanently? Unfortunately, it seems like numbers don't really work out when you try to sell lunch only, in a neighborhood where not many people eat lunch, and you have almost no seating (especially if the owners won't let anyone else work there). If you're a restaurateer/investor and you want to serve the best burger in the city (under $12 price range), not to mention make some money for charity, get in touch. I'm bummed that Mission Burger won't be around anymore. Big fan here. Fabulous menu last night!! It was my wife's first time and she enjoyed it a lot! Thanks for all you do!